Before Apple released the iPad 2, Garrett Gee made a lucky guess. "I knew it was going to have a camera, and because of that I just imagined that there would be a blog post or something similar on the top 10 new apps for the iPad 2," he says. Gee wasn't just the average college student geeking out. 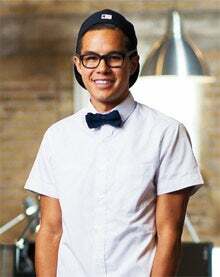 A student at Brigham Young University (BYU) in Provo, Utah, he is one of the founders of Scan (scan.me), which allows iPad, iPhone and Droid users to scan quick-response (QR) codes. QR curiosity led Garrett Gee to create Scan. Gee's push to get his hands on the iPad 2 and get it to his iOS developer was motivated by his desire for Scan to be the first QR-scanner app available specifically for the device--thereby earning a spot on those top 10 lists. Thanks to two sleepless nights, he succeeded. Gee's path from student to entrepreneur started in 2009, when he received a smartphone for Christmas. With that device, the then-freshman scanned his first QR code and realized there could be apps and software that were less clunky and easier to use. At a web-design conference, he met Twitter creative director Doug Bowman, who encouraged him to pursue his idea. Gee recruited classmates Kirk Ouimet and Ben Turley to help launch Scan in February 2011. The idea was to use simple online and mobile tools to give users a better option for scanning QR codes, and to offer a polished option for businesses that wanted to create those codes. "There are many, many sites where you can go and create your own QR code," Gee concedes. "Remember when Facebook and Twitter were first getting popular, and businesses large and small all hopped on and started creating Twitter accounts and Facebook pages? They didn't really know how or why; they were just doing it because they thought it was important. It's been the same story with QR codes. People see them popping up all over the place, and they're like, 'Yeah, we should probably use QR codes for our marketing.'" Gee, Ouimet and Turley took second place in BYU's business plan competition in April 2011--a status they parlayed into funding. After 16 trips to pitch to investors such as Google Ventures, Menlo Ventures and the co-owner of the Boston Celtics, they had $1.5 million. Gee waded through the offers while balancing school and travel as a forward on BYU's semiprofessional soccer team, often taking conference calls in airport bathrooms along the way. The team used that capital to build a platform and user base that earned Scan 10 million downloads in the first year. The actual scans derived from those downloads grew from 12 million to 21 million between September and October 2011. The next move is to develop a monetization plan. Today the software to read or create codes is free of charge; future options will include premium content and mobile-commerce templates. Gee, now 25, is working toward graduating from BYU. For now, the dual student-CEO role is serving him well. "People relate to the student world quite well," he says. "You could say I play the 'student card' quite often when I'm meeting with big companies. It definitely scores me empathy points."